The Hansa S 5A drawing from MJD Models is published as a construction article in the Swedish hobby magazine “Allt om Hobby” issue 2, 3 & 4 – 2005. This is a small sized scale model with “big” performance. 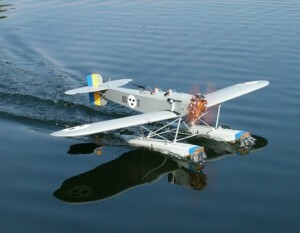 The Hansa S 5A is a slow flying floatplane with a lot of charm. The floats of the Hansa S 5A, works great on water, snow and even wet grass! Its large wing area makes it an interesting model with superb handling qualities. It has ideal proportions for a flying scale model. This model is recommended to the average builder/pilot with experience from a couple of models before. The Hansa S 5A has a scale contour and can be built to a very accurate model of the full size. The Hansa S 5A (Heinkel He 5) was a reconnaissancefloat plane used by the Swedish air force between 1921 until 1946! With its large wing area and powerful Bristol Jupiter engine the S 5A version was a versatile floatplane. It did outstanding service as an ambulance, light bomber, etc. One even managed to shoot down a German Heinkel 111 that trespassed Swedish airspace in WW II.